If regular fitness and exercise is something you shifted up a gear in January, your body is likely to be feeling the effects of the workout. Aches and strains are absolutely normal and likely a good sign as these sensations indicate that your routine is at the right level of challenge to make an impact on your muscles and waistline. If you’ve decided to keep on going with your routine throughout February and beyond, first of all, well done! Not everyone is as determined as you to achieve their goals so you should be very proud. And now that you have begun to establish a routine, it’s important to ensure that you have the right nutrition in place to support you during your workout. This blog will examine some of the vitamins and minerals required to keep your bones, muscles and bodily systems happy as you exercise, so that you can continue to #BeResolute and hit the gym regularly. Most people know that calcium is good for your bones but actually, vitamin D and magnesium also play essential supporting roles and, in many cases, calcium would struggle without their assistance! It’s also not just your bones that benefit from these nutrients, your muscles also profit from a piece of the action. Calcium, vitamin D and magnesium all contribute to the maintenance of normal muscles and bones; two body parts that have had a hammering over the last month if exercise is new to your agenda. Calcium is found in dairy products like milk and cheese, but foods like tinned sardines (with bones), okra, kale and broccoli are also excellent sources. When it comes to the muscles, calcium’s role is to regulate contractions, and this includes your heartbeat – another reason why it’s essential if you’ve taken up strenuous exercise! The average adult needs 700mg of calcium a day and a deficiency in this macromineral could lead to muscle weakness, bone pain and partial fractures. Vitamin D facilitates calcium’s absorption and a study published by The Journal of the American Osteopathic Association identifies that vitamin D cannot be metabolised efficiently unless an adequate amount of magnesium is also in the system, so all three of these nutrients depend on the other in order to properly fulfill their duties. Vitamin D is found in fatty fish like salmon and mackerel, and magnesium can be sourced from potatoes, spinach and tomatoes. 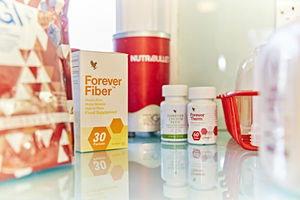 Forever Living offers several great products that can help boost your vitamin and macromineral intake this February. 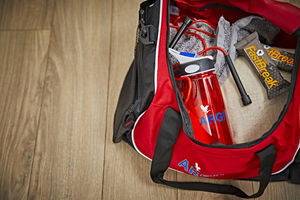 Argi+ is the perfect sports drink to carry with you while you exercise as it’s high in vitamin D and if you chuck a Forever Fast Break bar in your gym bag to eat with your Argi+, you’ll gain all three of these mighty nutrients during your workout. A Forever Lite Ultra shake in chocolate or vanilla also makes for a delicious treat post workout, plus it’s high in all three of these muscle and bone-loving nutrients to ensure you are fully covered. Fitness fanatics’ favourite food group should not be dismissed as a fad, because protein actually does play a major role in your body, and one that’s especially important during exercise. Protein contributes to the growth in and maintenance of muscle mass, and also in the maintenance of normal bones. That’s why it’s often favoured after a workout to help with repair and recovery. The recommended daily allowance of protein is 46g for women and 56g for men, and Forever Lite Ultra provides a whopping 24g when made with skimmed milk. You can make up the rest with all sorts of delicious foods including eggs, chicken, oats, Greek yoghurt, broccoli, tuna and quinoa. Vitamin C, also known as ascorbic acid, is a water-soluble vitamin that does an immense amount for your body, particularly when it comes to growth and development. Since it’s water-soluble, vitamin C cannot be stored, and this means you need to constantly top up your daily supply. The best sources of vitamin C can be obtained from a wide array of fruits and vegetables – another reason why it’s so important to eat your five-a-day! In terms of exercise, there are many benefits to ensuring your diet is high in this vitamin: vitamin C contributes to normal collagen formation for the normal function of bones and cartilage, and also to the reduction of tiredness and fatigue. In addition, if you consume 200mg, it will specifically help to maintain normal immune function after intense physical exercise. The NHS state that adults aged 19-64 need at least 40mg of vitamin C a day, however consuming over this (but below 1,000mg) shouldn’t do you any harm – your body will just expel what’s not used. You certainly shouldn’t have a problem obtaining this minimum allowance if you eat a diet that’s rich in fruit and veg, but it’s useful to know that some fruit juices are also excellent sources of vitamin C. Be warned however, juices are often high in sugar and other additives or preservatives. 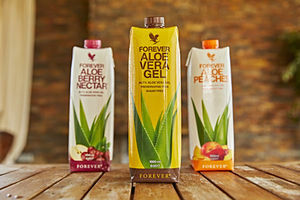 Thankfully, Forever Living’s aloe drinking gels (Forever Aloe Vera Gel, Forever Aloe Peaches and Forever Berry Nectar) offer numerous health benefits, including a high dose of vitamin C, but these drinks are free from preservatives, additives and high amounts of sugar. Another product that may be useful in assisting your exercise regime is Forever Therm. Forever Therm plays a significant role in Forever’s weight management programmes, including the C9 and F15, and that’s because it’s high in vitamin C and other nutrients, including vitamins B6 and B12. Carbohydrates have unfairly been branded the nemesis of the healthy-eater in recent years, but this vital macronutrient actually plays an essential role, both as you work out and in your everyday life. If you eat enough, carbohydrates will contribute to the recovery of normal muscle function after highly intensive and long-lasting physical exercise; such exercise can lead to muscle fatigue and the depletion of glycogen store in skeletal muscle. There are three types of carbohydrates: sugar, starch and fibre. Over half of your daily calorie intake should be obtained from carbohydrates (starchy foods that come from plants, fruits and vegetables) but you should only go for wholemeal starch options that are high in fibre – things like brown pasta, wholegrain bread and brown rice. This type of starchy food will slowly release energy throughout the day which is another reason why carbohydrates are essential before exercise. When it comes to sugar, we are talking about natural sugars that are found in fruit, vegetables and milk, not sugars that are added to products such as biscuits, cereals and fizzy drinks – those are the kind of ‘carbs’ you want to avoid! Alongside wholegrain starches, vegetables, fruits, pulses, oats and nuts are all valuable sources of fibre. Adults should aim to consume 30g of fibre a day in order to support digestive processes but if you’re struggling to get your daily dose, a supplement like Forever Fiber may be helpful at keeping your fibre levels topped up. A sachet of Forever Fiber contains 5g of fibre and it can be mixed with water or your favourite beverage to make a mild-tasting drink. The above list is simply scratching the surface of essential nutrients your body requires, as actually many of the bodily systems work together. A compromised immune system, poor digestion and cognitive problems can of course impact one’s ability to effectively exercise, which is why it’s always important to eat a balanced diet that provides you with a wide variety of nutrients for every function. There’s no doubt that nutrition and exercise go hand in hand, so if you really want to push through the challenges this February, it’s essential that you do your research and eat well. Do this, and you will continue to #BeResolute through this month and beyond. Do you take any Forever supplements to help with your nutrient intake? Let us know your favourites in the comments below.